The Galaxy S5 is Samsung’s flagship device for 2014/15, and boasts improvements that include a fingerprint sensor that can be used to authenticate payments. Along with NFC, the Samsung Galaxy S5 also features a 5.1-inch full HD Super Amoled display, a 2.5GHz quad core processor plus 16 megapixel rear and 2 megapixel front cameras. The LTE smartphone runs Android 4.4.2 Kitkat, is waterproof and dustproof and supports 802.11ac WiFi. The Verge has full details here. 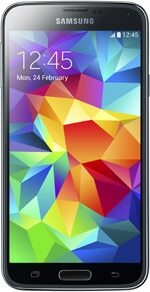 The Galaxy S5 was announced on 24 February 2014 and will be available globally in black, white, electric blue and copper gold from April.